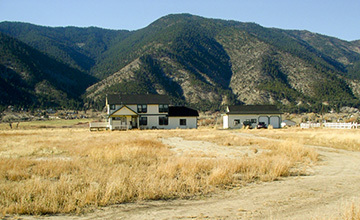 Located on the historic 800-acre River Fork Ranch near Genoa Nevada, the River Fork Ranch project, lead by The Nature Conservancy, included the planning and design of a five-phase trail system with the goal of providing educational and active opportunities for the general public while maintaining minimal disruption to the sustainable agriculture, and restored native wetlands, floodplain, waterways, and habitats. We prepared a master plan for the trail system, as well as the design documents necessary for construction, permitting, and construction bid process. Due to funding restrictions, only Phase 1 of construction has moved forward at this time. We have prepared the topographical survey for design for the project. 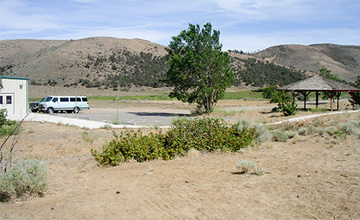 The project’s features includes an extensive trail system to provide access to a variety of natural points of interest provided by the site, including public access to the Carson River, an ADA compliant outdoor interpretive addition to the existing Whit Hall Interpretive Center featuring a path, signage, planting areas, boardwalks and providing key connection points to several future off site trailhead locations all while working to minimize the project footprint through the use of existing, recycled, and natural materials. 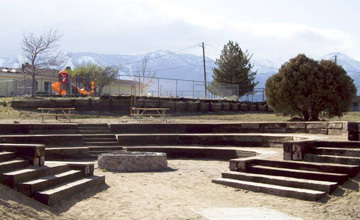 The Washoe Tribe’s Woodfords community located in Alpine County, California was underserved by existing park facilities and was comprised of limited, improved outdoor space for the local community to gather. The existing facilities were dilapidated, and were a potential liability issue for the community. 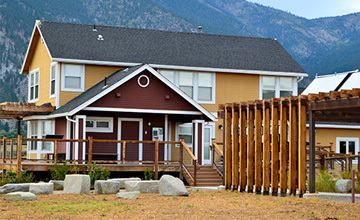 However, since some of these improvements were constructed by tribal members who had since passed away, the structures held deep sentimental value for the local community. Furthermore, undesignated flood areas also affected the existing improvements. 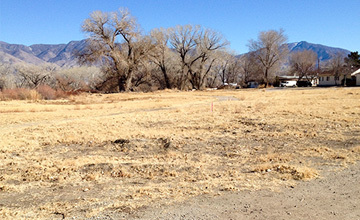 Alpine County Public Works Department wanted to create a 2-acre native park site located at a highly used community center for the Woodfords Community of the Washoe Tribe of Nevada and California. We performed a detailed topographic survey of the site used in the design development of the schematic landscape plans, hydrology calculations and channel design. 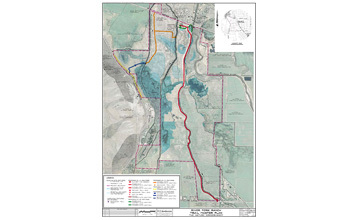 Upon completion of the schematic plans and recommended channel design to convey 100 year storm flows through the site, members of our firm conducted a series of community meetings with Tribal Council Members and community members to discuss the project and its overall importance to the community. We obtained community feedback and designed the new facility to reflect the communities’ needs and cultural values. 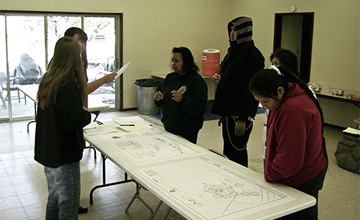 We then prepared Construction Drawings for the implementation of the park improvements using native and culturally important design principles. The plan included a 4,000 square foot community talking circle, ADA accessible pedestrian circulation and native revegetation of all disturbed areas. We reused certain elements of the existing structures and incorporated them into the new improvements, thereby keeping the values and memories alive through their implementation of the new park improvements. The City of Bishop wanted to develop a safe route to its regional park, accessible to both pedestrians and bicyclists traveling from neighborhoods located south of the park. There were numerous constraints, including shallow sewer trunk lines, future park improvements that might conflict with the planned route, drainage issues, potential wetlands, and privacy issues with adjacent residents. As an outgrowth of these issues, the City realized that more comprehensive planning of the future park facilities was necessary to plan for and mitigate these potential conflicts. 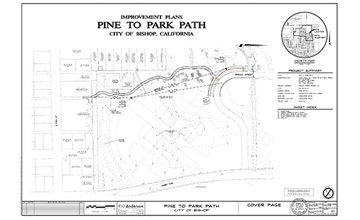 The Pine to Park Path project began as a desire for a safer pedestrian connection to the existing city park and blossomed into a comprehensive park master plan designed to meet the recreational and leisure needs of the citizens of Bishop and Inyo County. In conjunction with the environmental documents for the Path and using this information to inform the City Park Master Plan, we held a series of community meetings and met with key stakeholders to develop three alternatives plans for consideration. These plans were refined with community input and a final plan was developed. 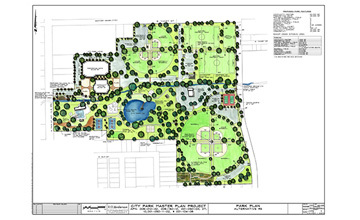 The City Park Master Plan includes an expanded pedestrian circulation plan, accommodations for the city’s very active adult and youth softball, soccer and football leagues, an arboretum and community garden, as well as a community center and performing arts building. We went beyond our initial plans when faced with many challenges with the existing park facilities. We addressed them by including limited parking facilities, upgrading a variety of existing active courts and designating a dog park for canines who frequently visited the park with their owners.